ADP 125 | Video Converter | Systemation Technology Inc. 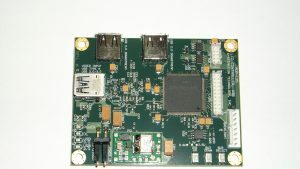 This board uses the latest chip from Displaylink. It can output either 1 or 2 channel LVDS at resolutions up to 1920×1080. Two USB 2.0 downstream ports provide USB for peripherals such as touch screen, keyboards and mouse. Drivers for most LCDs are available from Systemation Technology, or Display Link.